7.1.1.1 – What is the IoT? Students should complete Chapter 7, “Assessment” after completing Chapter 7. Describe the Cisco IoT System. 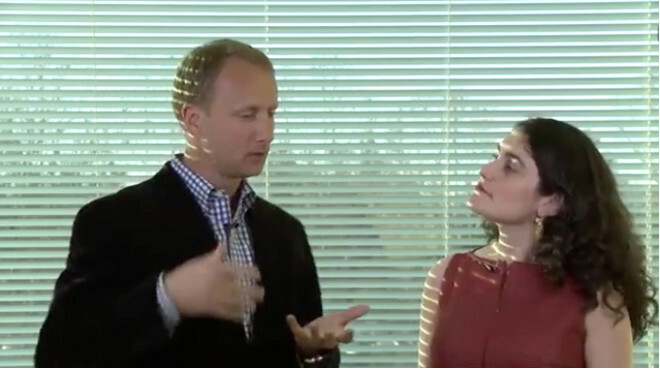 Describe the pillars of the Cisco IoT System. 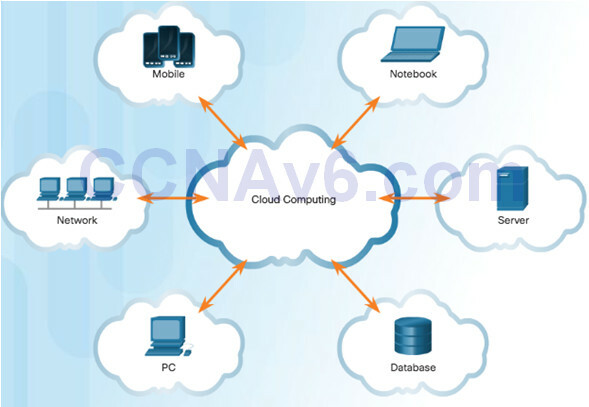 Explain the importance of cloud computing. Explain the importance of virtualization. 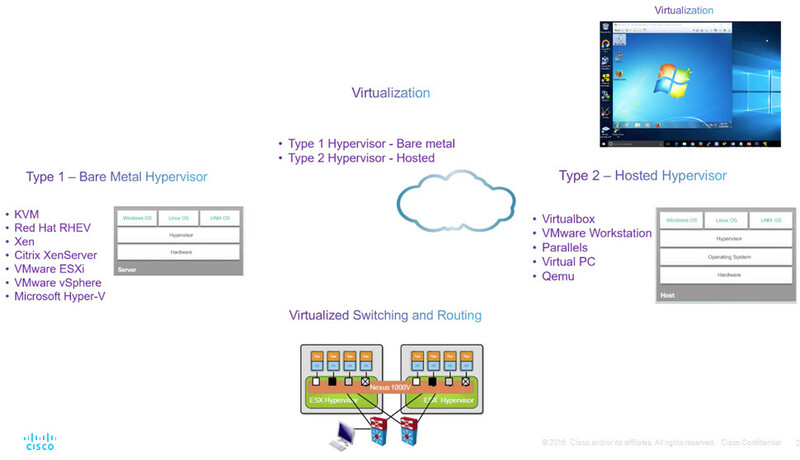 Describe the virtualization of network devices and services. Describe controllers used in network programming. It is predicted that the Internet will interconnect 50 billion things by 2020. Using existing and new technologies, we are connecting the physical world to the Internet. It is by connecting the unconnected that we transition from the Internet to the Internet of Things (IoT). Dissimilar networks are converging to share the same infrastructure. This infrastructure includes comprehensive security, analytics, and management capabilities. 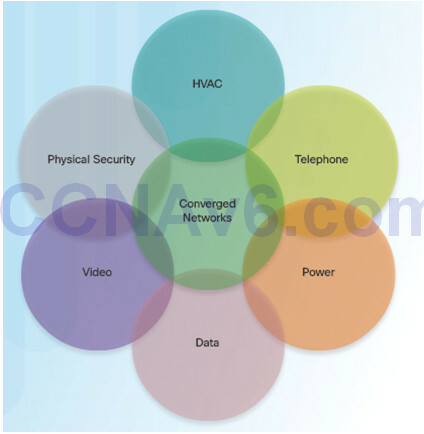 The connection of the components into a converged network that uses IoT technologies increases the power of the network to help people improve their daily lives. Digitization means connecting people and things, and making sense of the data in a meaningful and secure way. Cisco IoT System uses six pillars to identify foundational elements. All IoT devices need network connectivity and the equipment needed varies depending on the type of network. Home networks typically consist of a wireless broadband router, while business networks will have multiple switches, APs, a firewall or firewalls, routers, and more. This IoT network model identifies a computing infrastructure closer to the network edge. Edge devices run applications locally and make immediate decisions. Data does not need to be sent over network connections. Enhances resiliency by allowing IoT devices to operate when network connections are lost. Enhances security by keeping sensitive data from being transported beyond the edge where it is needed. IoT introduces new attack vectors not typically encountered with normal enterprise networks. Operational Technology (OT) specific security – OT is the hardware and software that keeps power plants running and manages factory process lines. IoT Network security – Includes network and perimeter security devices. IoT Physical security – Cisco Video Surveillance IP Cameras. IoT can connect billions of devices capable of creating exabytes of data every day. To provide value, this data must be rapidly processed and transformed into actionable intelligence. Need to bring centers of data together and take advantage of data. IoT expands the size and diversity of the network to include the billions of smart objects that sense, monitor, control, and react. Each of these areas also has distinctive requirements, including the need to track specific metrics. 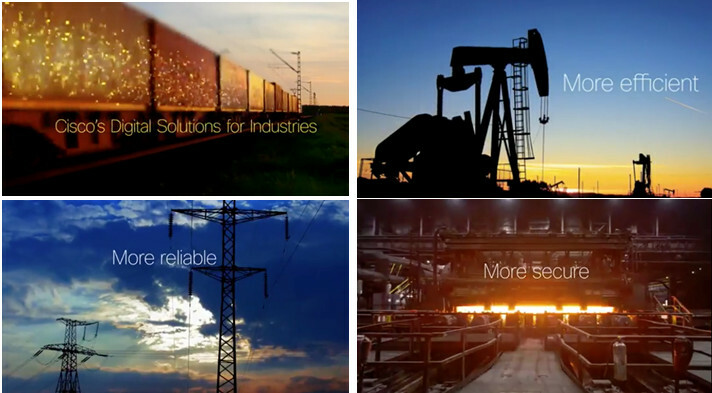 Cisco management and automation products can be customized for specific industries to provide enhanced security and control and support. Management Tools: Cisco IoT Field Network Director, Cisco Prime, Cisco Video Surveillance Manager, and more. 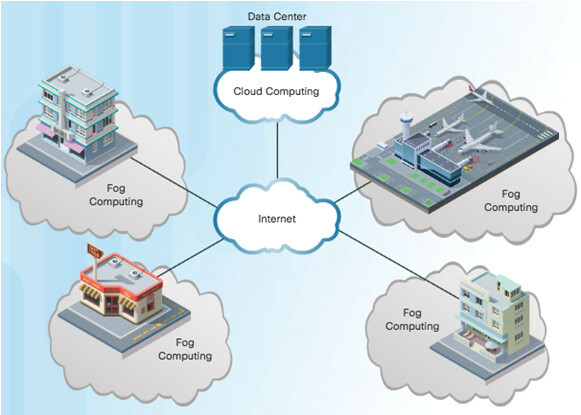 Provides the infrastructure for application hosting and application mobility between cloud and Fog computing. Cisco IOx which is a combination of Cisco IOS and Linux, allows routers to host applications close to the objects they need to monitor, control, analyze, and optimize. Listen to the Interview about IOx! The “pay-as-you-go” model where capital expenditures are transferred to operating expenses. Large numbers of networked computers physically located anywhere. Providers rely heavily on virtualization. Reduce operational costs by using resources more efficiently. Software as a Service (SaaS): Access to services, such as email and Office 365 that are delivered over the Internet. Platform as a Service (PaaS): Access to the development tools and services used to deliver the applications. Infrastructure as a Service (IaaS): Access to the network equipment, virtualized network services, and supporting network infrastructure. IT as a Service (ITaaS): IT Professionals support applications, platforms and infrastructure. Public clouds: Application and services made available to the general population. Services may be free or are offered on a pay-per-use model, such as paying for online storage. Uses the Internet to provide services. Private clouds: Applications and services are intended for a specific organization or entity, such as the government. A private cloud can be set up using the organization’s private network, though this can be expensive to build and maintain. A private cloud can also be managed by an outside organization with strict access security. Hybrid clouds: Made up of two or more clouds (example: part private, part public), where each part remains a distinctive object, but both are connected using a single architecture. Community clouds: A community cloud is created for exclusive use by a specific community. For example, healthcare organizations must remain compliant with policies and laws (e.g., HIPAA) that require special authentication and confidentiality. Data center: Typically a data storage and processing facility run by an in-house IT department or leased offsite. Cloud computing: Typically an off-premise service that offers on-demand access to a shared pool of configurable computing resources. These resources can be rapidly provisioned and released with minimal management effort. Virtualization is the foundation of cloud computing. Without it, cloud computing would not be possible. Cloud computing separates the application from the hardware. Virtualization separates the OS from the hardware. Amazon Elastic Compute cloud (Amazon EC2) web service provides a simple way for customers to dynamically provision the computer resources they need. These virtualized instances of servers are created on demand in Amazon’s EC2. In the figure, the previous eight dedicated servers have been consolidated into two servers using hypervisors to support multiple virtual instances of the operating systems. 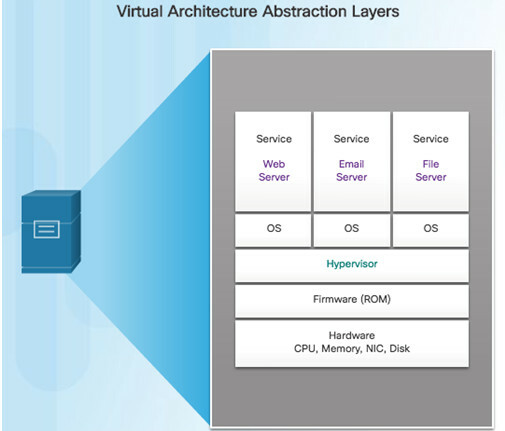 Hypervisor is a program, firmware, or hardware that adds an abstraction layer on top of the real physical hardware. 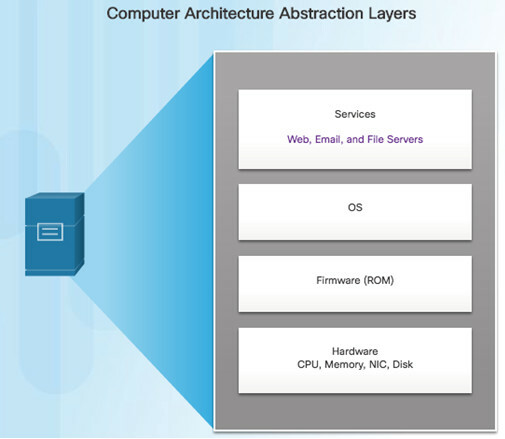 The abstraction layer is used to create virtual machines which have access to all the hardware of the physical machine such as CPUs, memory, disk controllers, and NICs. It is not uncommon for 100 physical servers to be consolidated as virtual machines on top of 10 physical servers that are using hypervisors. Less equipment is required – Server consolidation and lower maintenance costs. Less energy is consumed – Consolidating servers lowers the monthly power and cooling costs. Less space is required – Fewer servers, network devices, and racks reduce the amount of required floor space. A hypervisor is installed between the firmware and the OS. 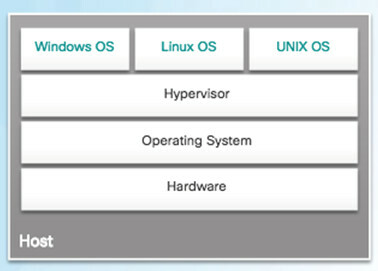 The hypervisor can support multiple instances of OSs. 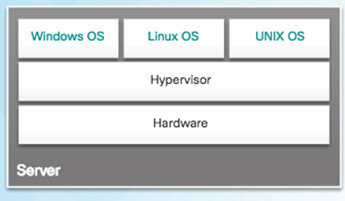 A hypervisor is software that creates and runs VM instances. The computer, on which a hypervisor is supporting one or more VMs, is a host machine. Type 2 hypervisors are also called hosted hypervisors. This is because the hypervisor is installed on top of the existing OS, such as Mac OS X, Windows, or Linux. Hypervisor is installed directly on the hardware. Usually used on enterprise servers and data center networking devices. 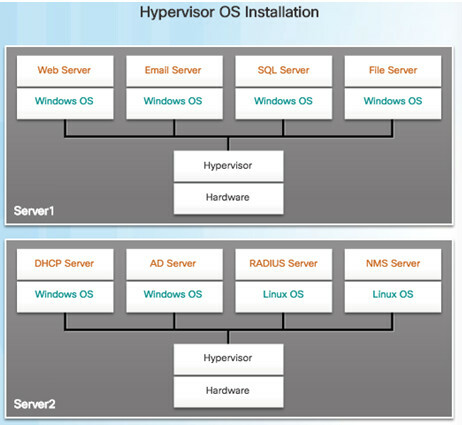 Instances of an OS are installed on the hypervisor. Type 1 hypervisors have direct access to the hardware resources. Improve scalability, performance, and robustness. Type 1 hypervisors require a “management console” to manage the hypervisor. 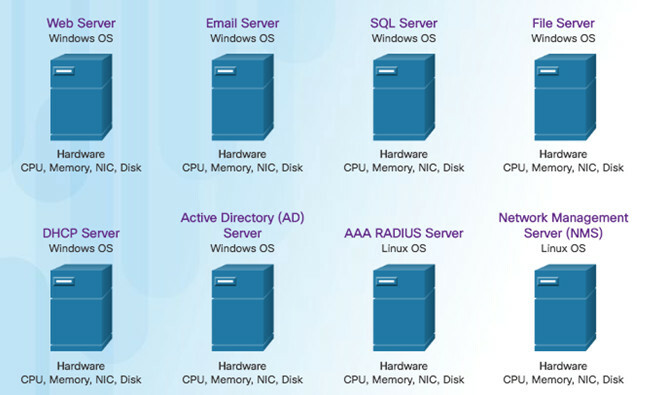 Management software is used to manage multiple servers using the same hypervisor. The management console can automatically consolidate servers and power on or off servers as required. Assume that Server1 in the figure becomes low on resources. To make more resources available, the management console moves the Windows instance to the hypervisor on Server2. The management console provides recovery from hardware failure. If a server component fails, the management console automatically and seamlessly moves the VM to another server. 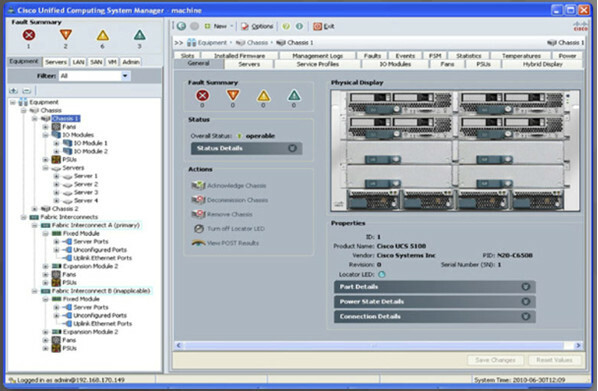 The management console for the Cisco Unified Computing System (UCS) is shown in the figure. Cisco UCS Manager controls multiple servers and manages resources for thousands of VMs. Server virtualization hides server resources from server users. This practice can create problems if the data center is using traditional network architectures. For example, Virtual LANs (VLANs) used by VMs must be assigned to the same switch port as the physical server running the hypervisor. However, VMs are movable, and the network administrator must be able to add, drop, and change network resources and profiles. This process is difficult to do with traditional network switches. Another problem is that traffic flows differ substantially from the traditional client-server model. Typically, a data center has a considerable amount of traffic being exchanged between virtual servers (referred to as East-West traffic). These flows change in location and intensity over time, requiring a flexible approach to network resource management. Existing network infrastructures can respond to changing requirements related to the management of traffic flows by using Quality of Service (QoS) and security level configurations for individual flows. However, in large enterprises using multivendor equipment, each time a new VM is enabled, the necessary reconfiguration can be very time-consuming. Control plane – Regarded as the brains of a device. Used to make forwarding decisions. Information sent to the control plane is processed by the CPU. Data plane – Also called the forwarding plane, this plane is the switch fabric connecting the various network ports on a device. The data plane of each device is used to forward traffic flows. 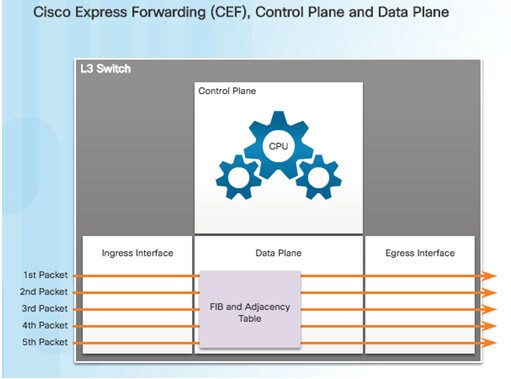 CEF is an advanced, Layer 3 IP switching technology that enables forwarding of packets to occur at the data plane without consulting the control plane. Packets are forwarded directly by the data plane based on the information contained in the Forwarding Information Base (FIB) and adjacency table, without needing to consult the information in the control plane. To virtualize the network, the control plane function is removed from each device and is performed by a centralized controller. The centralized controller communicates control plane functions to each device. Each device can now focus on forwarding data while the centralized controller manages data flow, increases security, and provides other services. 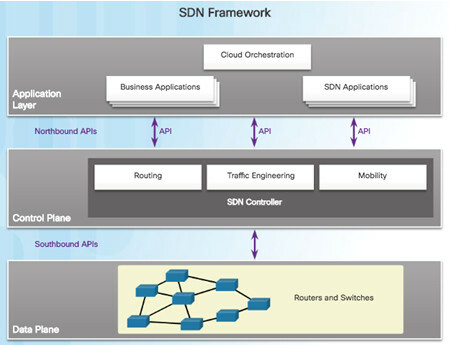 Software Defined Networking (SDN) – A network architecture that virtualizes the network. Cisco Application Centric Infrastructure (ACI) – A hardware solution for integrating cloud computing and data center management. 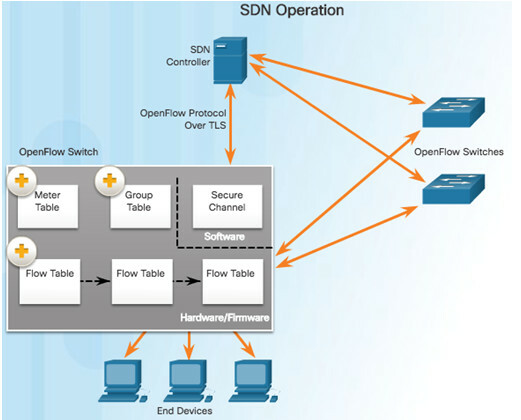 OpenFlow- The OpenFlow protocol is a basic element in building SDN solutions. OpenStack- This approach is a virtualization and orchestration platform available to build scalable cloud environments and provide an infrastructure as a service (IaaS) solution. In a traditional router or switch architecture, the control plane and data plane functions occur in the same device. Routing decisions and packet forwarding are the responsibility of the device operating system. Software defined networking (SDN) is a network architecture that has been developed to virtualize the network. 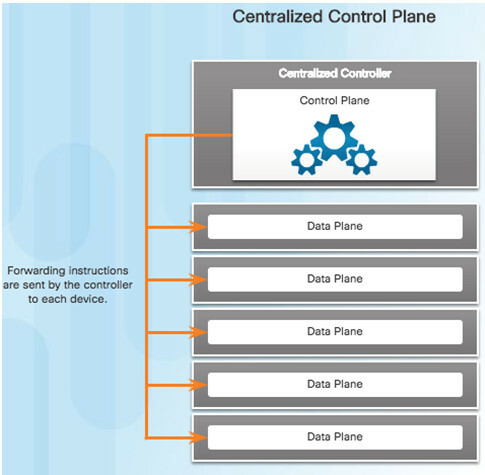 SDN can virtualize the control plane. SDN moves the control plane from each network device to a central network intelligence and policy-making entity called the SDN controller. The SDN controller enables network administrators to manage and dictate how the data plane of virtual switches and routers should handle network traffic. 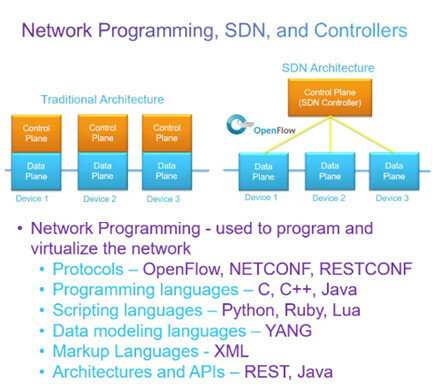 The SDN controller uses northbound APIs to communicate with the upstream applications. These APIs help network administrators shape traffic and deploy services. The SDN controller also uses southbound APIs to define the behavior of the downstream virtual switches and routers. An API is a set of standardized requests that define the proper way for an application to request services from another application. 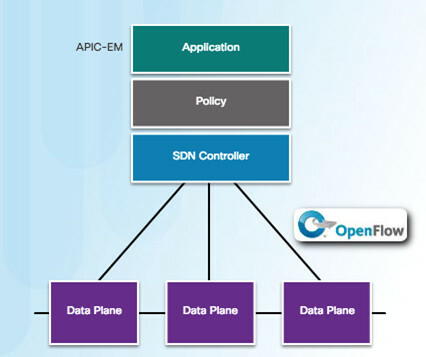 OpenFlow is the original and widely implemented southbound API. 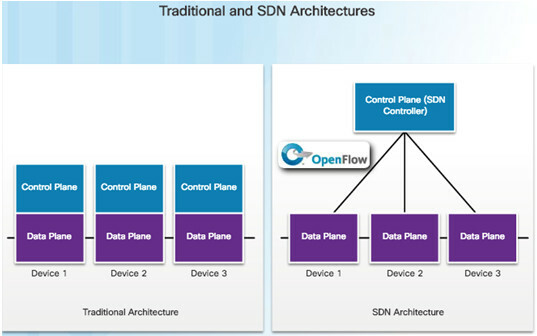 SDN controller defines the data flows that occur in the SDN Data Plane. A flow could consist of all packets with the same source and destination IP addresses, or all packets with the same VLAN identifier. Each flow traveling through the network must first get permission from the SDN controller. If the controller allows a flow, it computes a route for the flow to take and adds an entry for that flow in each of the switches along the path. The controller populates and the switches manage the flow tables. Each OpenFlow switch connects to other OpenFlow switches. They can also connect to end-user devices that are part of a packet flow. To the switch, a flow is a sequence of packets that matches a specific entry in a flow table. 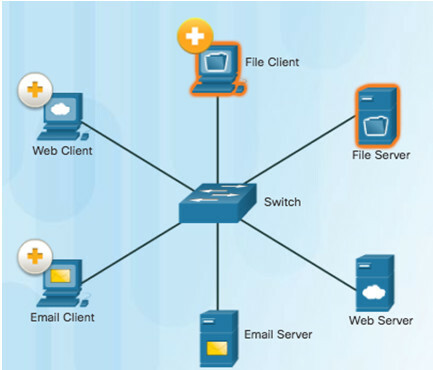 Application Network Profile (ANP) – Collection of end-point groups (EPG), their connections, and the policies that define those connections. 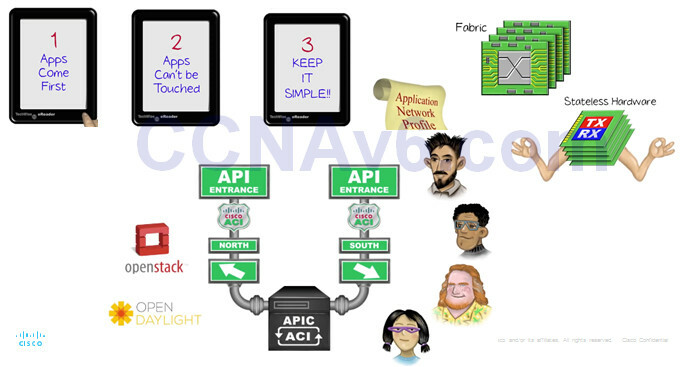 Application Policy Infrastructure Controller (APIC) – The brains of the ACI architecture. A centralized software controller that is designed for programmability and centralized management. Translates application policies into network programming. Cisco Nexus 9000 Series switches – Provide an application-aware switching fabric and work with an APIC to manage the virtual and physical network infrastructure. 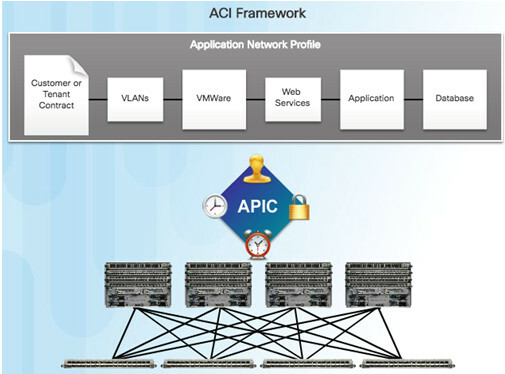 APIC is positioned between the ANP and the ACI-enabled network infrastructure. 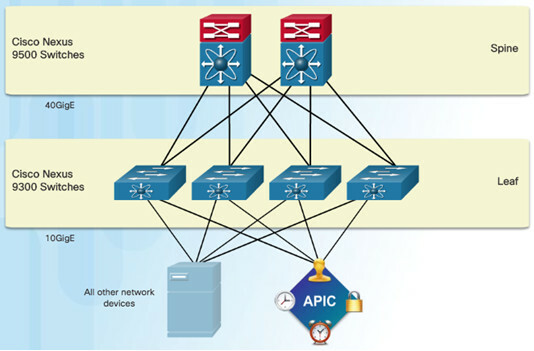 The APIC translates the application requirements into a network configuration to meet those needs. Cisco ACI fabric is composed of the APIC and the Cisco Nexus 9000 series switches using two-tier spine-leaf topology, as shown in the figure. Leaf switches always attach to the spines, but they never attach to each other. Spine switches only attach to the leaf and core switches (not shown). Cisco APICs and all other devices in the network physically attach to leaf switches. 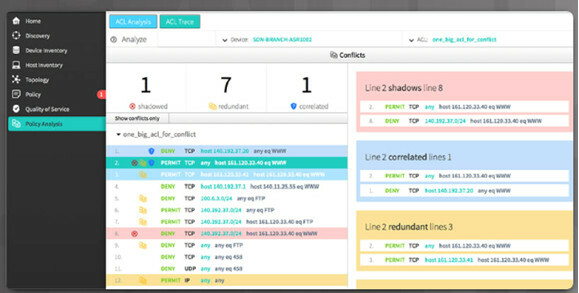 When compared to SDN, the APIC controller does not manipulate the data path directly. The APIC centralizes the policy definition and programs the leaf switches to forward traffic based on the defined policies. Device-based SDN – The devices are programmable by applications running on the device itself or on a server in the network. 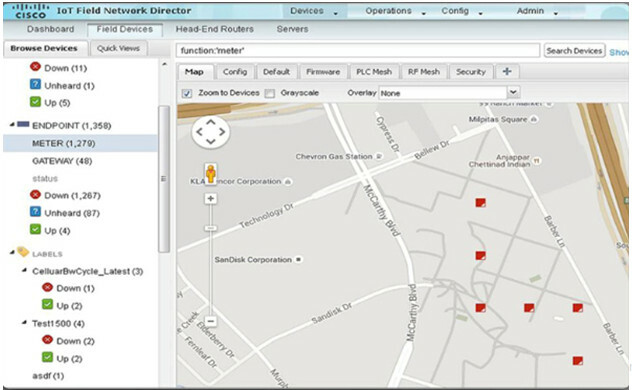 Cisco OnePK is an example of a device-based SDN. It enables programmers to build applications to integrate and interact with Cisco devices. Controller-based SDN – Uses a centralized controller that has knowledge of all devices in the network. The applications can interface with the controller responsible for managing devices and manipulating traffic flows throughout the network. 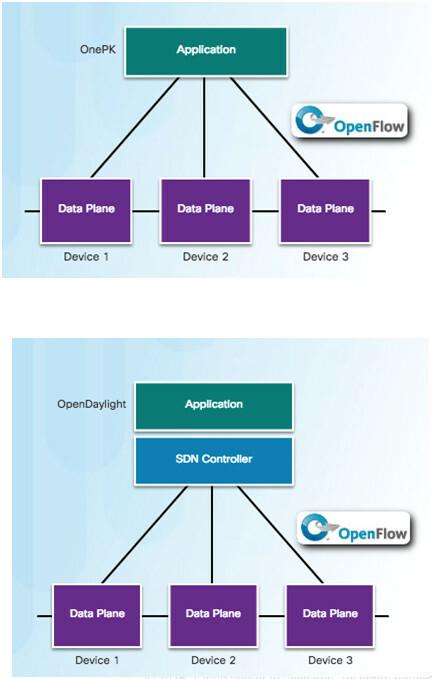 The Cisco Open SDN Controller is a commercial distribution of OpenDaylight. Policy-based SDN – Similar to controller-based SDN where a centralized controller has a view of all devices in the network. Includes an additional Policy layer. Uses built-in applications that automate advanced configuration tasks via a guided workflow and user-friendly GUI. No programming skills are required. Cisco APIC-EM is an example of this type of SDN. Policy-based SDN is the most robust, providing for a simple mechanism to control and manage policies across the entire network. Discovery – Supports a discovery functionality that is used to populate the controller’s device and host inventory database. Device Inventory – Collects detailed information from devices within the network including device name, device status, MAC address, IPv4/IPv6 addresses, IOS/Firmware, platform, up time, and configuration. Host Inventory – Collects detailed information from hosts with the network including host name, user ID, MAC address, IPv4/IPv6 addresses, and network attachment point. Policy- Ability to view and control policies across the entire network including QoS. Topology – Supports a graphical view of the network (topology view). Policy Analysis – Inspection and analysis of network access control policies. Ability to trace application specific paths between end devices to quickly identify ACLs in use and problem areas. 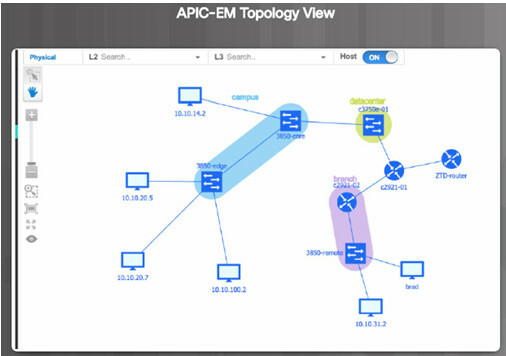 One of the most important features of the APIC-EM controller is the ability to manage policies across the entire network. APIC-EM ACL Analysis and Path Trace provide tools to allow the administrator to analyze and understand ACL policies and configurations. ACL Analysis Tool – Enables ACL inspection and interrogation across the entire network, exposing any problems and conflicts. ACL Path Trace – This tool examines specific ACLs on the path between two end nodes, displaying any potential issues.